As with starting to paint a picture, one rarely starts on a dark backdrop. Maybe an analogy better might be your bathroom. I know, but if you will indulge me for a moment, they are usually small, always bright and when the light bursts in it makes all of the difference. See image below. 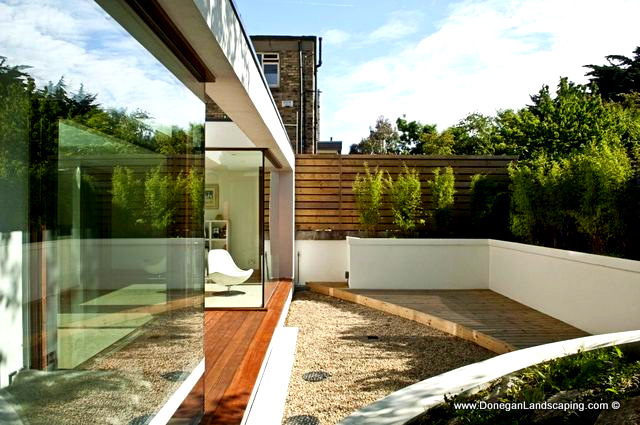 The colour choice, of neutral or white has a knock on effect, at a minimum from a plants perspective (I’ll get to that in a little bit) and, whilst the timber panels or walls may appear better painted something different as individuals pieces – this is entirely about the collective garden (as an overall space) rather than the standalone. The photosynthetic complexities, of flower and foliage, always stand out better against the clean and rather simple. And the alternate can be quite chaotic. In better detail and of recent, new homes seem to come with a standard concrete post and hardware superstore type fence panel. The issue if you will, is that these measure (usually) 1.8 – 2.2 metres wide and chances are your garden will have 3 – 4 of these in width or length. My instant knowledge of your gardens dimensions aside, the garden is immediately broken up into perpendicular sections and photosynthetic spaces should are not usually designed to replicate supermarket shelves and their supports. 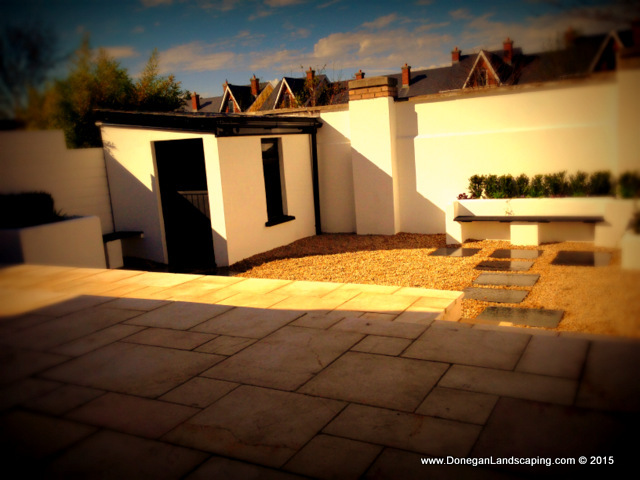 On a budget, paint it all masonry white – but, do consult your neighbour first. Drips through the lesser timber lats into their side may be an unwelcome surprise. A high quality masonry paint will do just perfect on the timber and the concrete and you may need 2 to three coats. Of concrete block, plaster finish first if you can – see image above. For not of square and rectangle spaces an alternate may be required – but if in doubt, keep it simple. This below pretty unimaginable if it were to absorb light as versus reflect. The above image allowed a change (it still exists you know), from the 1980’s logic of straight paths to practical spaces, towards sheds and along washing lines, et cetera. 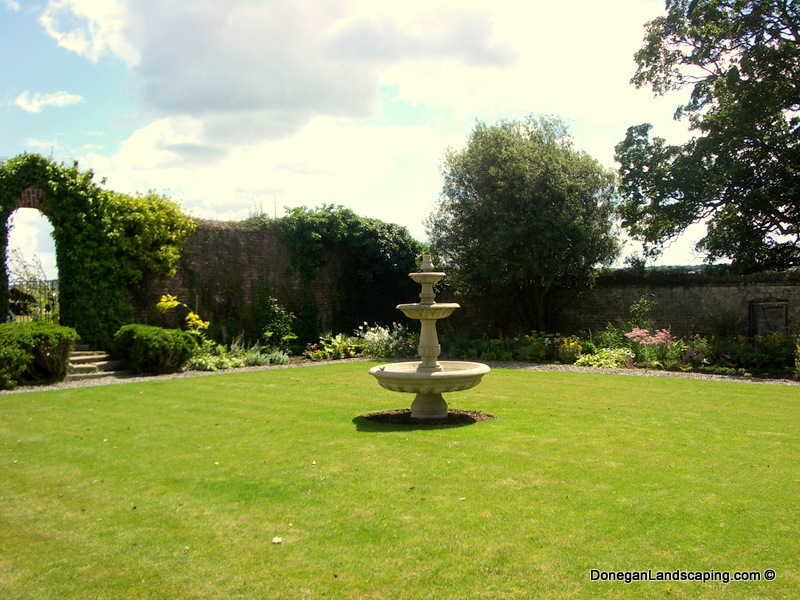 And, though I appreciate that logic – a garden should at the very least appear to be a place to woo and entice you out and allow you to unwind. Further and of far more importance, here I did not break the space into 2 narrower sections, rather I allowed the primary surface – the smaller, brighter pebble not to be the more dominant if you will, and a free flow through avoids the visual break. 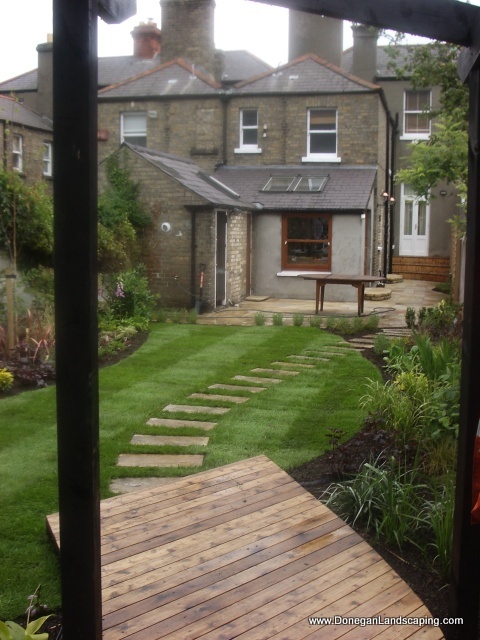 Below, it was a little different in that the front garden was 3 to almost 4 levels and it had to tie in with the existing rails and the street – or – appear as though it had always been there yet extremely well maintained. 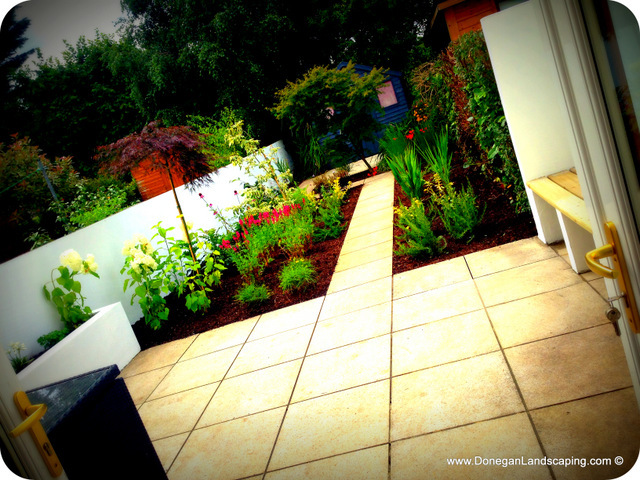 The alternate makes Peter Donegan look like a genius, but only when that garden is isolated. How and ever, the same basic principles apply – one main dominant simple colour and a smaller yet substantial (in this case of varying size) cut stone within. 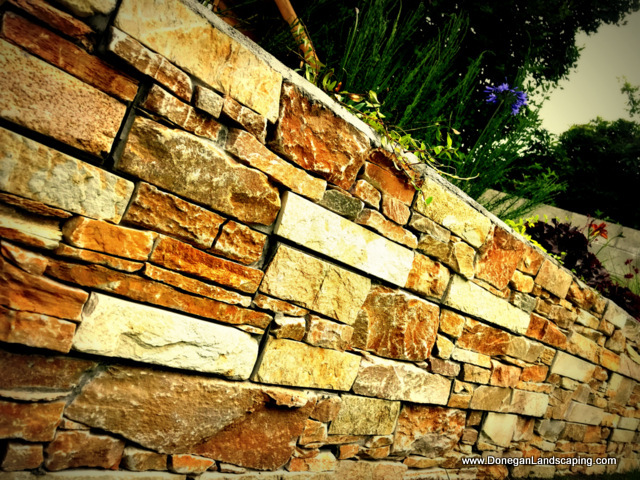 In lawns of small spaces, one literally swaps the colour of the stone for green. Again and as noted in point 1, there is a knock on effect to the next step, the planting. Back to it; this garden is not so much small rather narrow and though I personally prefer the steppings to be parallel and symmetric off each other – it is a good example of the darker dominant colour and the lesser brighter highlighting the length and drawing the eye. 3. Sheds and What Not. If the focal point of your garden is a 600 pound (or euro), timber shed, whilst we live in a world of the Tate and The Irish Museum of Modern Art then bring back the rubics cube and the etch a sketch and employ Cliff Richards to do singalongs at your 75th birthday party. My wry wit aside; This isn’t so much a personal – more I’m unsure why when it’s not a monetary decision, why one would wish stand at a sink (kitchen windows usually look out on to the back garden) washing up with a storage unit as a focal point. To give you a different take on it, below is what happens when a more dominant feature comes into play and the planting becomes mere secondary backdrop to it. They are put simply the basic principles of design that have been about for centuries. They have simply been adapted. On a budget or not – dumb the shed down in colour, here below in matt black, turn it sideways and then plant across the flat side of it as below. Then, throw some brighter colours over to the alternate side and nearest corners to draw your eye away from it. One is not saying it is not there; more there is something far prettier elsewhere. Alternates or extremes of height is the objective. Everything below knee height, reduced growing rates per annum (lower maintenance) and then brought in mature with similar growth attributes as they slow down in their maturity. This is the part where cut corners are most usually taken. 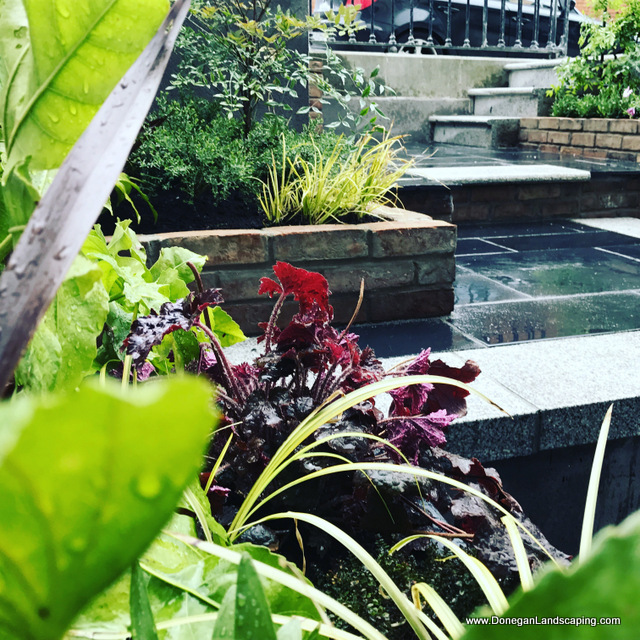 But it is the one element of the garden that will change it from – a house with individually nice elements to a home – and that, difference is colossal and something money if done rightly, will buy. If the trees – or – tall specimen plants are not an option, then very simply build the height and plant into that to draw the ye upwards. Again and of note – put simply, the plant has to be worth looking at. 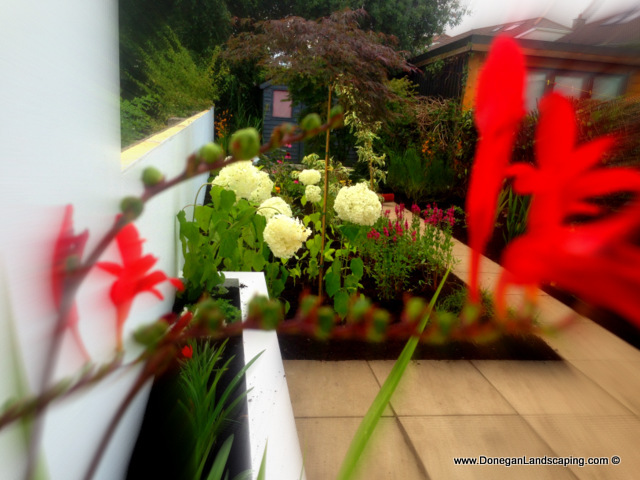 Below – the newer en vogue Hydrangea arborescens Incrediball meets Crocosmia. 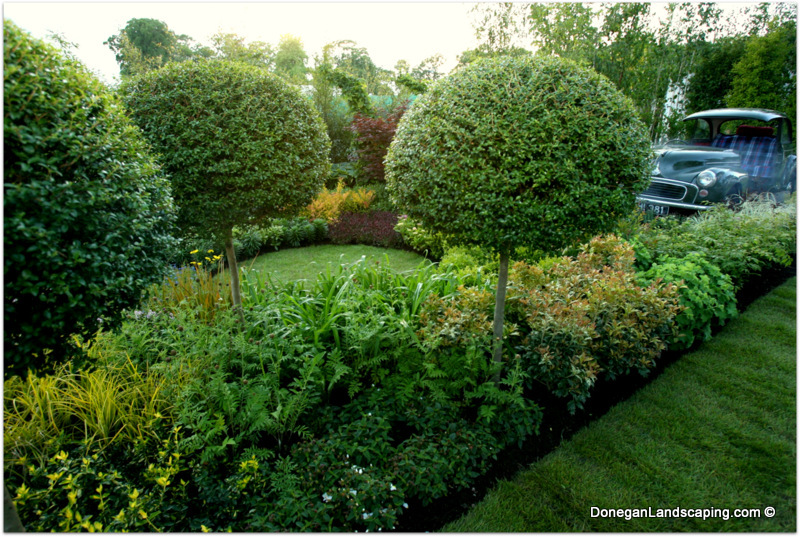 Below of the narrower beds the height is very much used of tall, slender and slower growing. 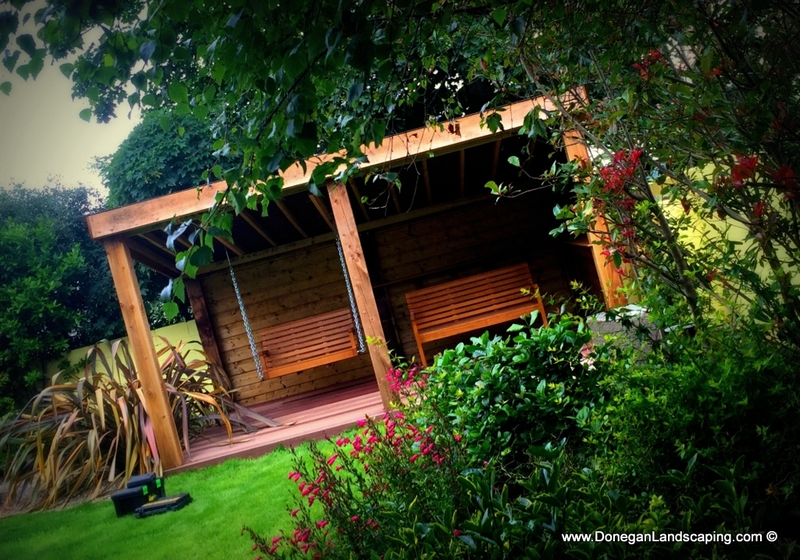 I’m showing the garden structure with fitted seats above solely as a notion of space, with one seat swinging and one moveable. It’s also not the norm for a garden bench (see shed above). My point you ask ? In tight spaces make the most of it and be creative. It doesn’t always have to be 2 straight beds along either wall. Below, the wall width was just a touch wider so one could sit on that and in the video above, albeit fitted – the timber is the same dimensions as the stone clad wall. Regarding garden furniture of tables and chairs – again I refer to the video above and I recommend you do the exact same before selecting and purchasing yours. go to the garden centre and sit down (bring grandmam with you) at the tables and chairs. This above is far from the sexiest image I could have shown, mainly due to the fence. How and ever it is were a greater percentage of a particular demographic are (statistically as versus my opinion), and may be leaning towards. This one side of a garden was built for a client (I hate that word), who wanted to be able to bring the garden with them when they moved. 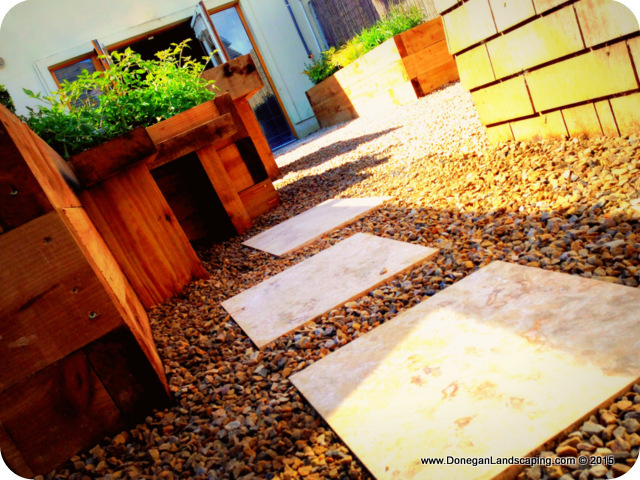 It contains apple trees, herbs, flower, scent and is a 3 metres squared surface area in total. ) 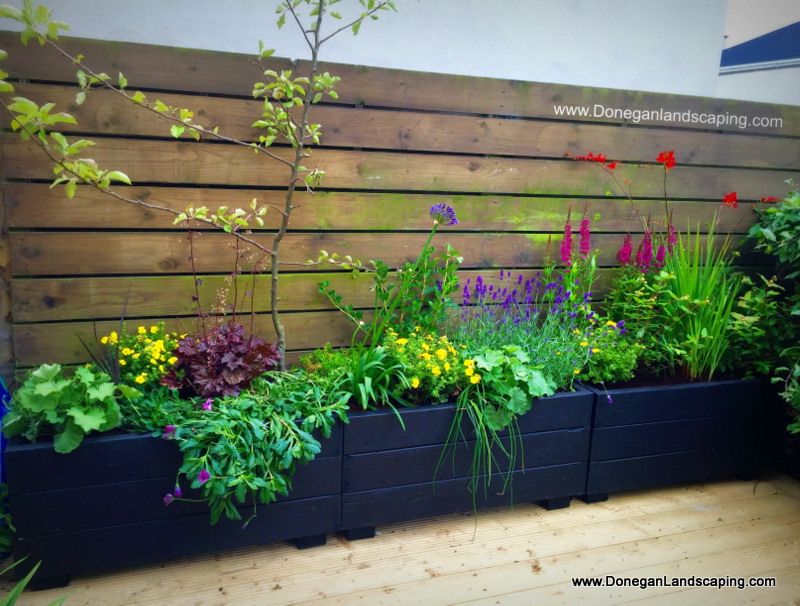 1 metre x 0.5 metres x 6 planters in total. 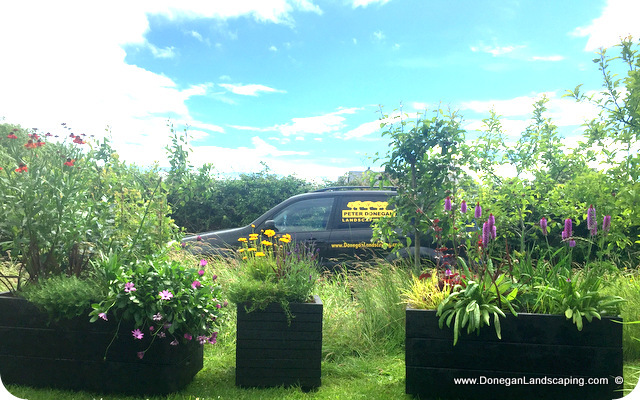 Plants were cherry picked if you will, and packed a little tighter to reduce light to the soil and create shading to those lower down and therefore reduce evaporation and transpiration – built off site and dropped in situ within a few hours. Simple effective, durable and not cheap. More a moveable investment and statistically, on the increase from this end. A far cry from my Nan’s 4712 pots that used to be absolutely everywhere. Here and of now, less is more and below, a far better backdrop. 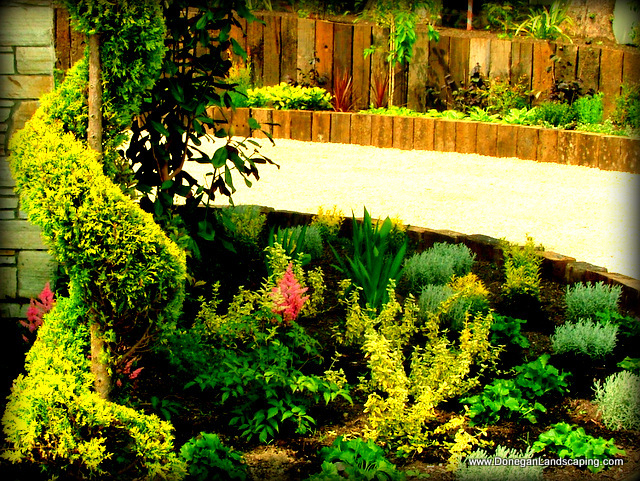 If you are not much of a gardener at all then this raised garden should prove just perfect. As with point 4, plant choice pays dividends when chosen correctly. 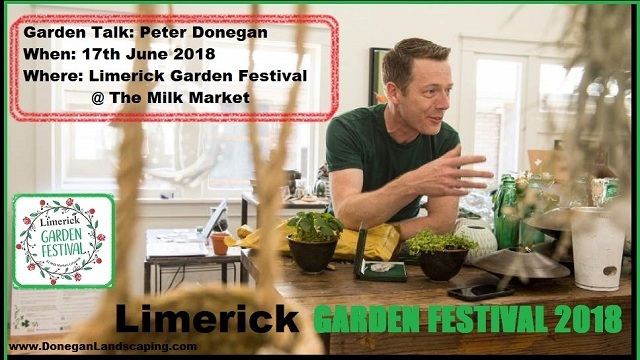 Images in place to help with the text, very much looking forward to seeing you in Limerick.